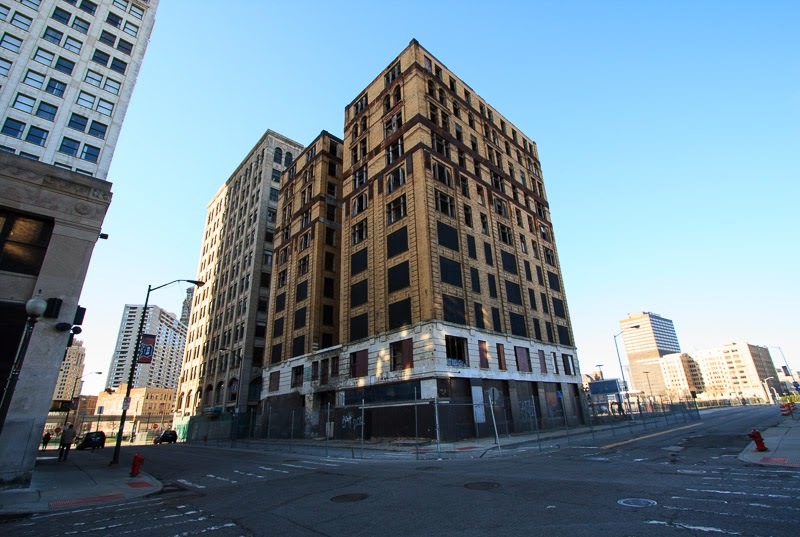 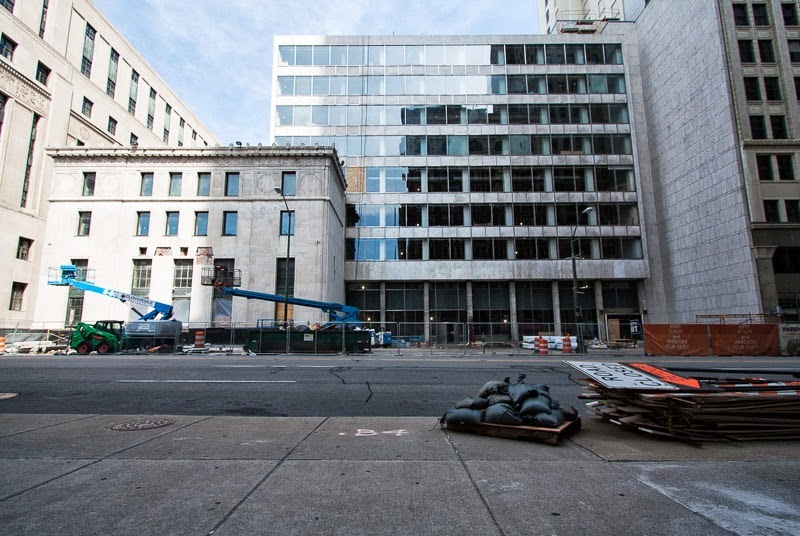 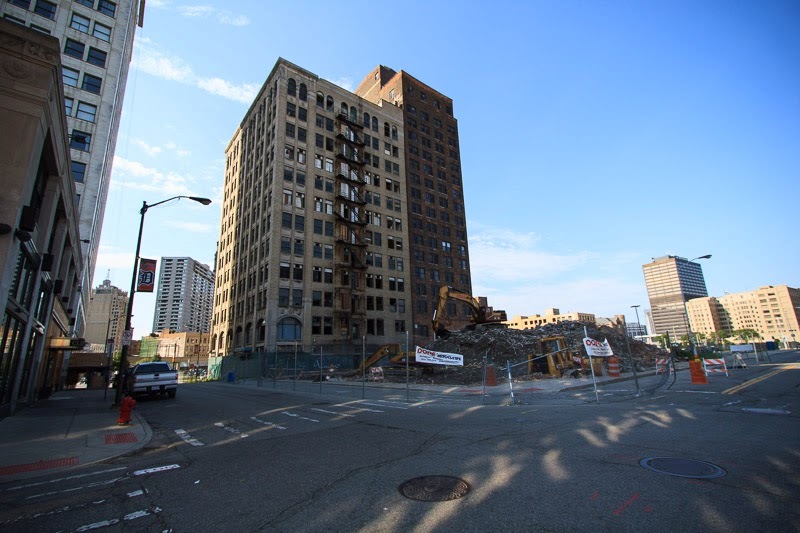 Andreas Apostolopoulos didn't his way with the Detroit Historic District Commission when he wanted to tear down the State Bank Building to build a parking garage for the Penobscot building, so he is taking it out on a terracotta building across from the Book Cadillac. The Bates Garage located at the corner of Monroe and Randolph was demolished in October. 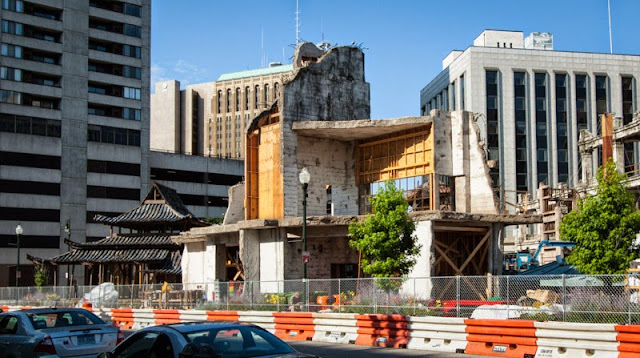 Here is a look at its final days. All that was left intact from the Globe Trading Company building. 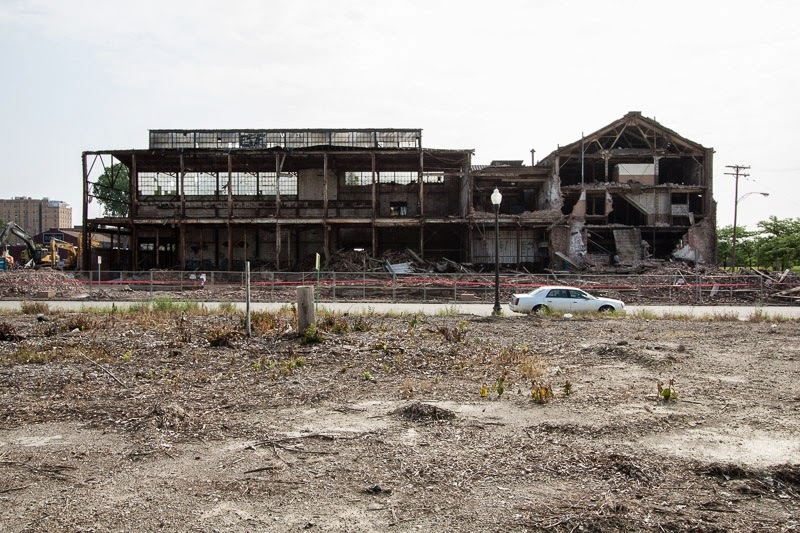 A decision on what to do with Wayne County's financial albatross is expected next week. 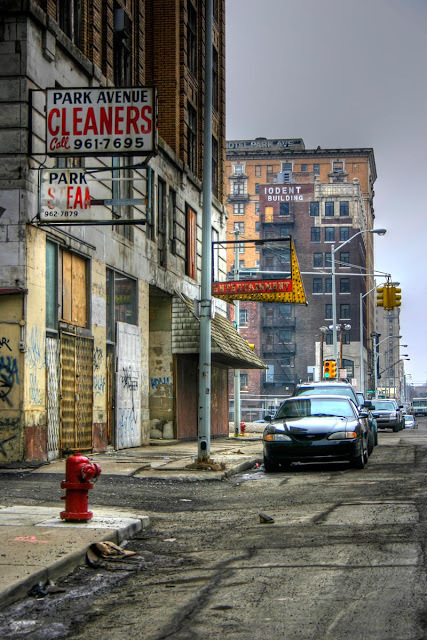 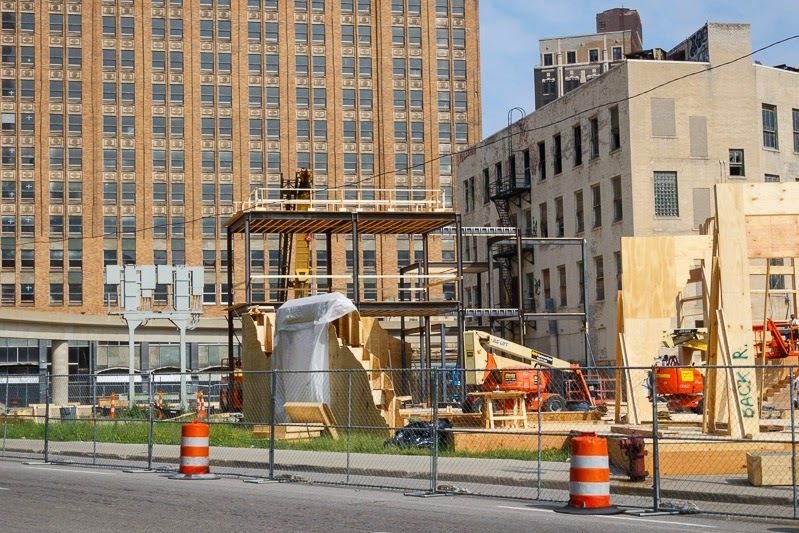 Shooting for Transformers 4 starts this week near Grand Circus Park. 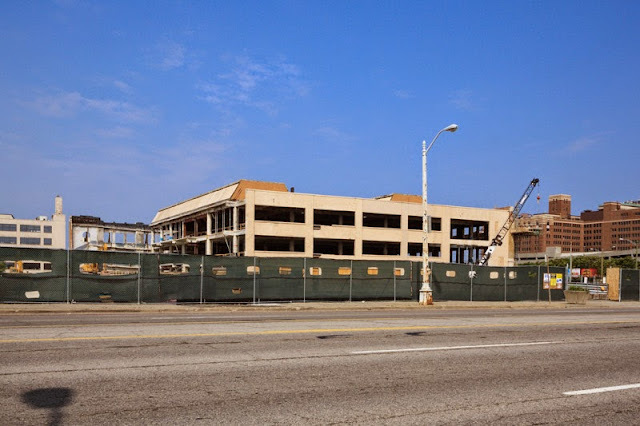 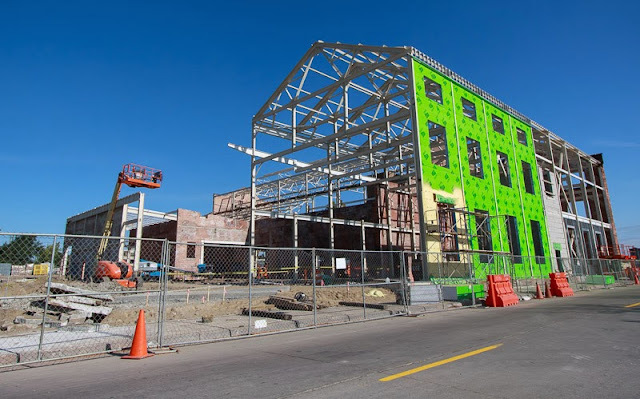 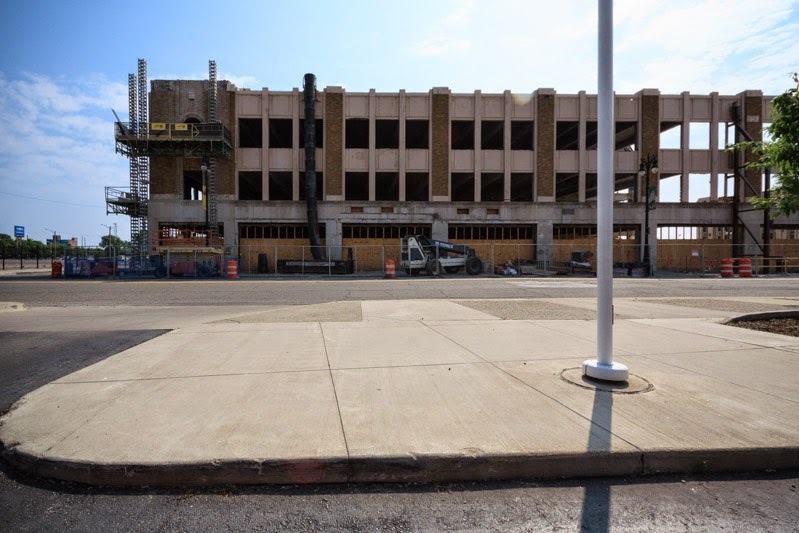 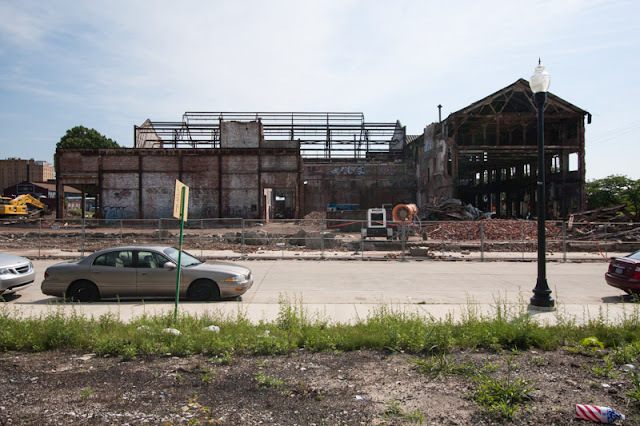 Dan Gilbert's first new build within the city of Detroit is showing noticeable progress along the site's Broadway frontage. Curbed Detroit has speculated that Iron Chef Michael Symon has been targeted to open up a B Spot burger joint inside the Z. 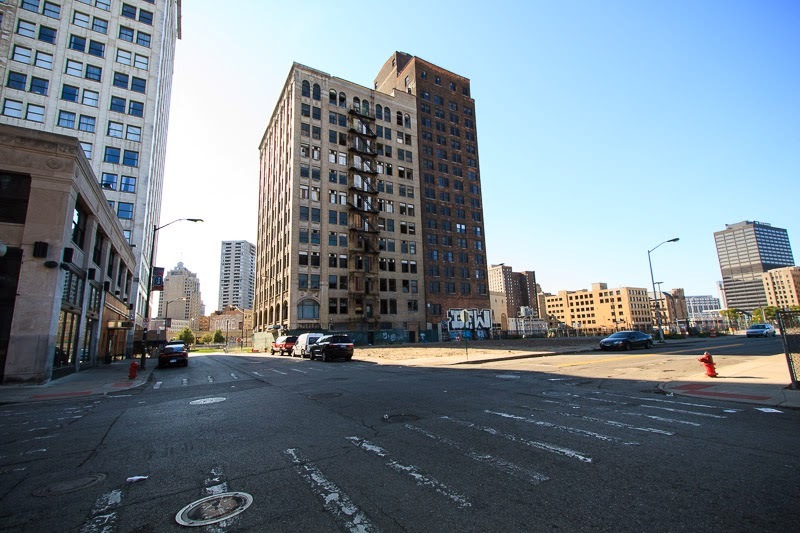 Something that was overlooked within Detroit's bankruptcy filing was an attachment listing all properties that the city owns that pose an "Imminent and identifiable harm to the public health or safety." 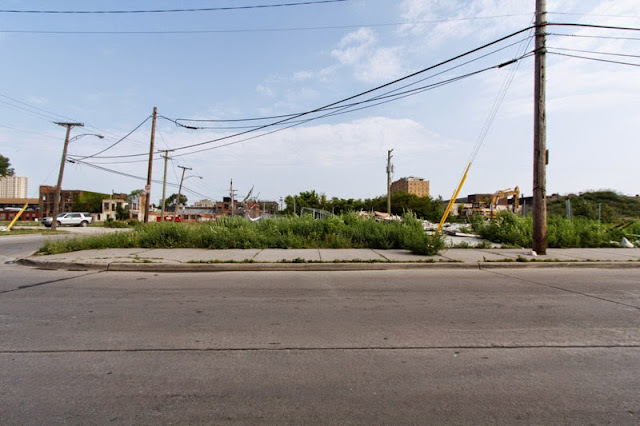 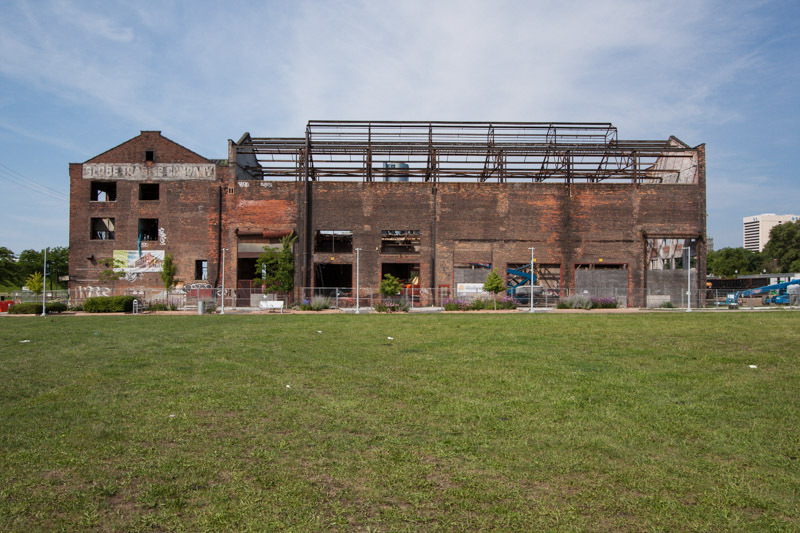 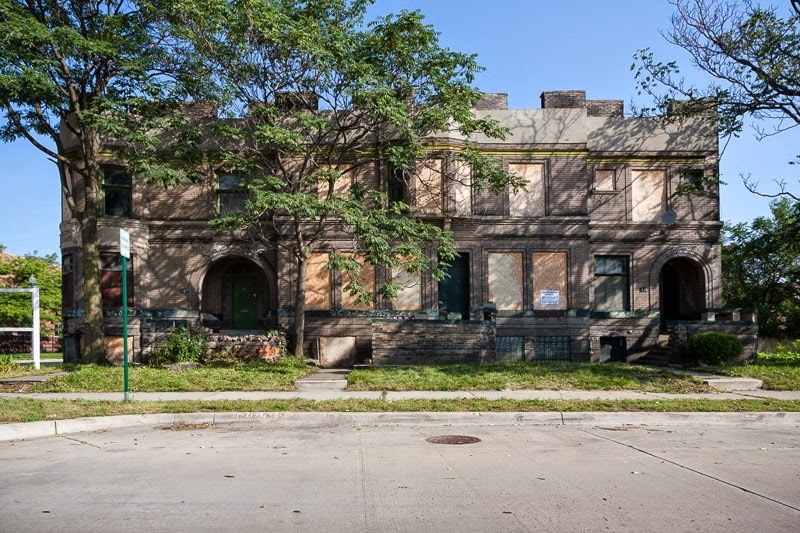 A few of the properties on the list are located in Brush Park. 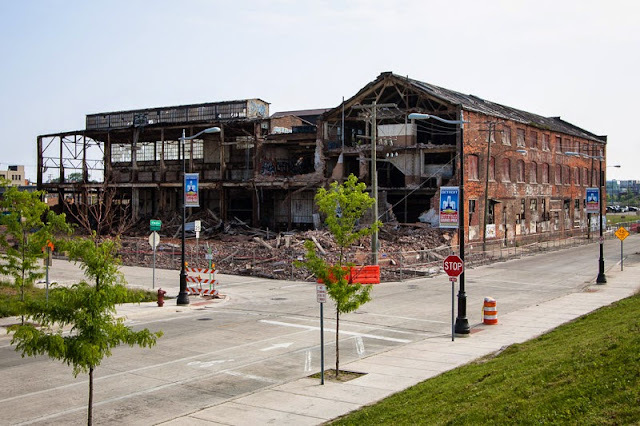 The City has identified those properties as being "structurally unsound and in danger of collapse." 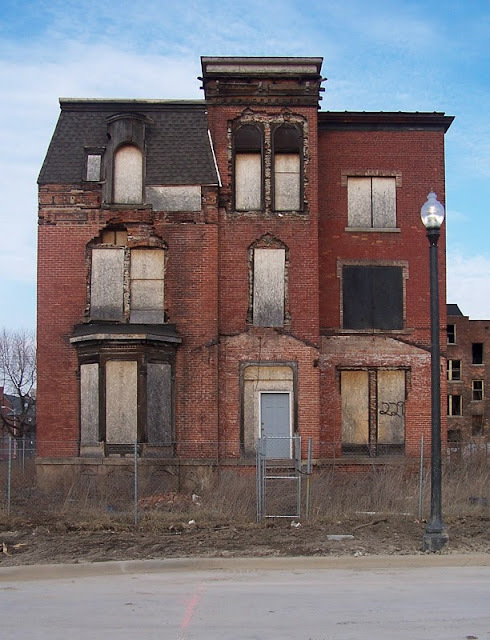 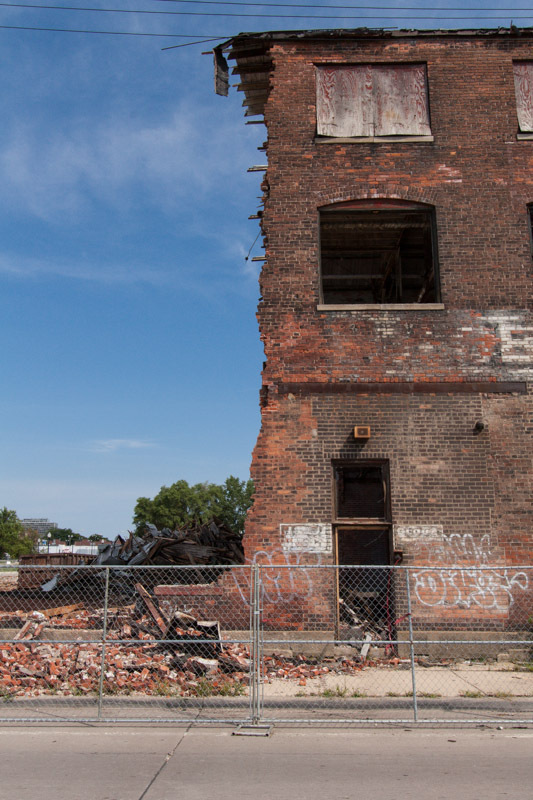 The City goes on to state that the properties are "scheduled for demolition." 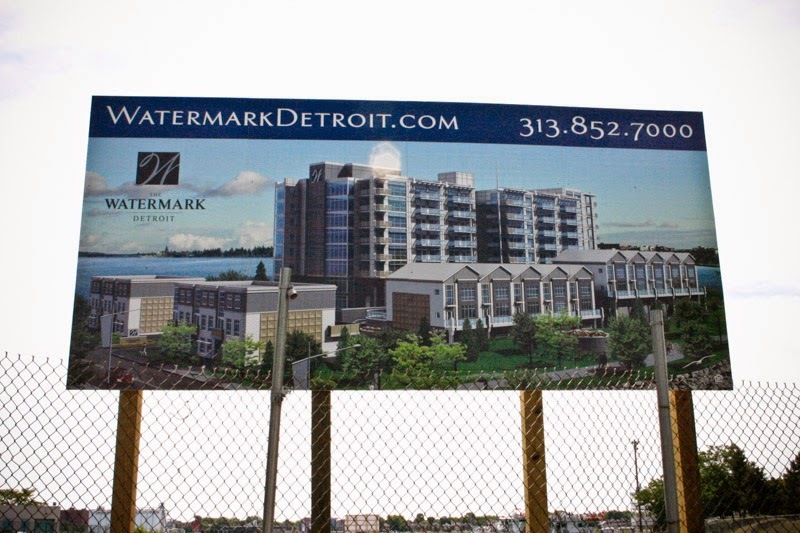 Someone finally removed the decaying model home for Mayor Dave Bing's failed Watermark development in early June. 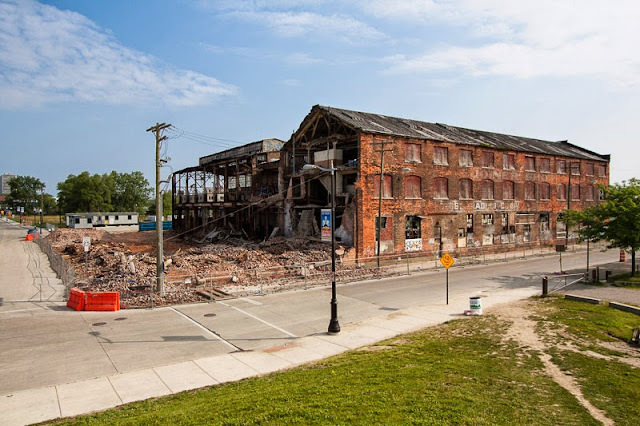 Labels: Demolition, Detroit, Hotel Charlevoix, Michigan. 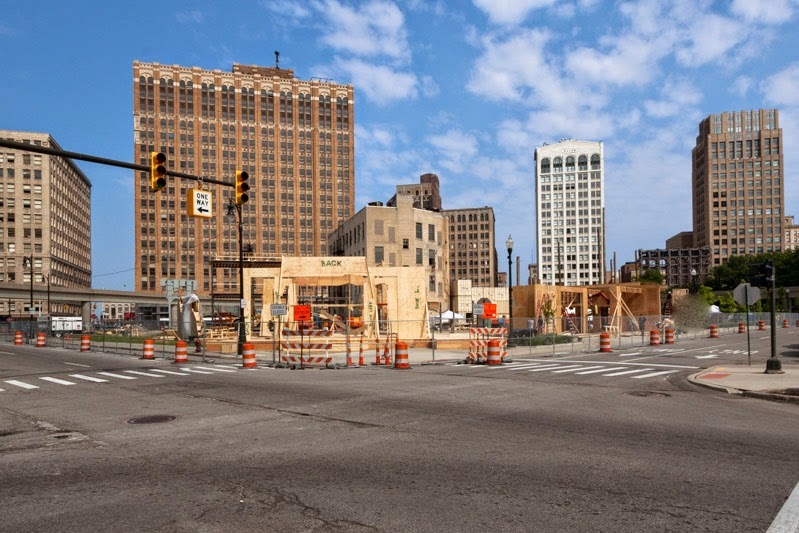 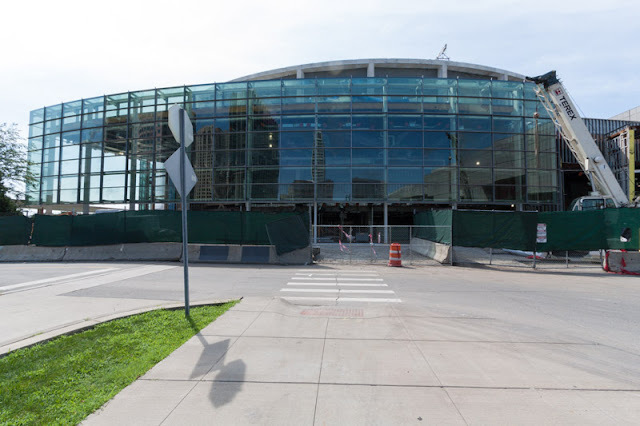 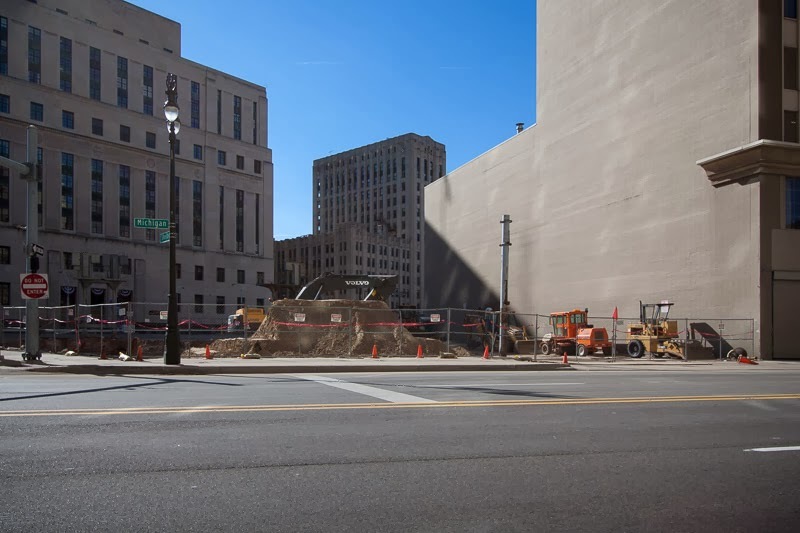 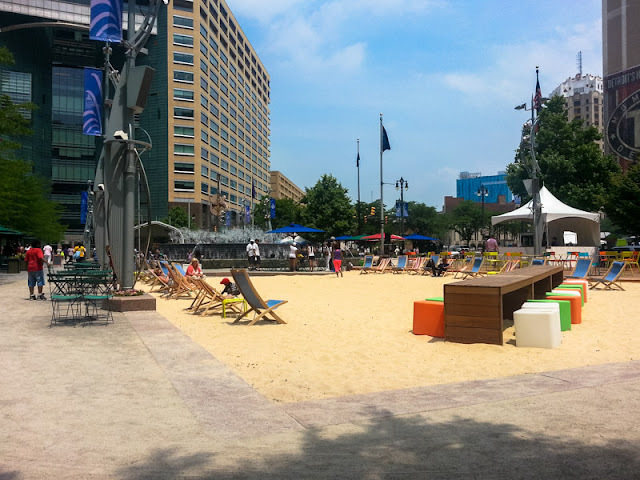 5,000 square feet of sand and decking along with the Beach Bar and Grille have been added to the southeastern corner of Campus Martius, initializing Dan Glibert's effort to place-make in downtown Detroit. 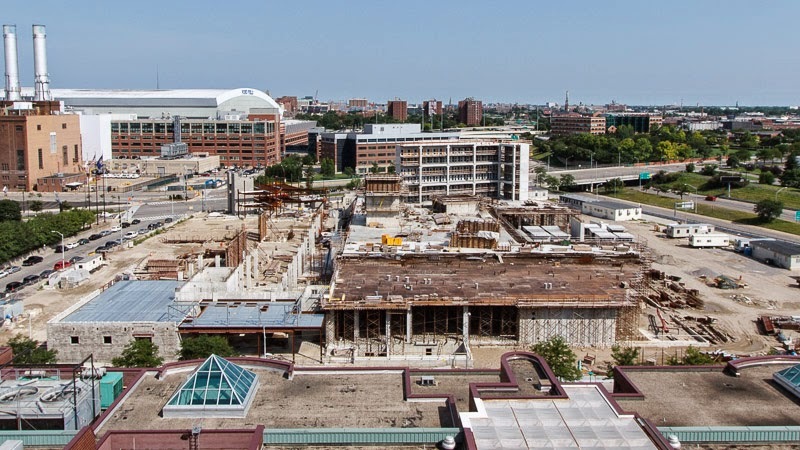 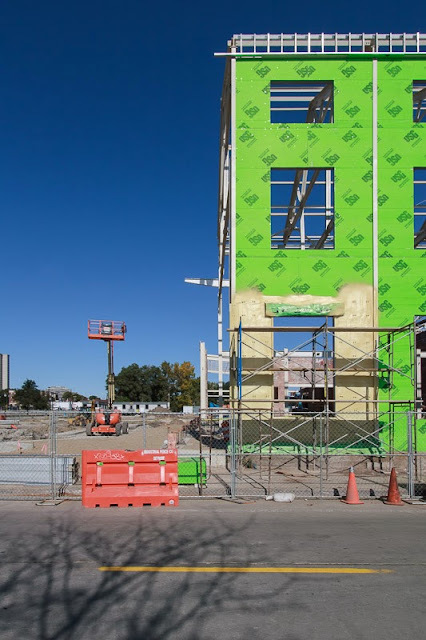 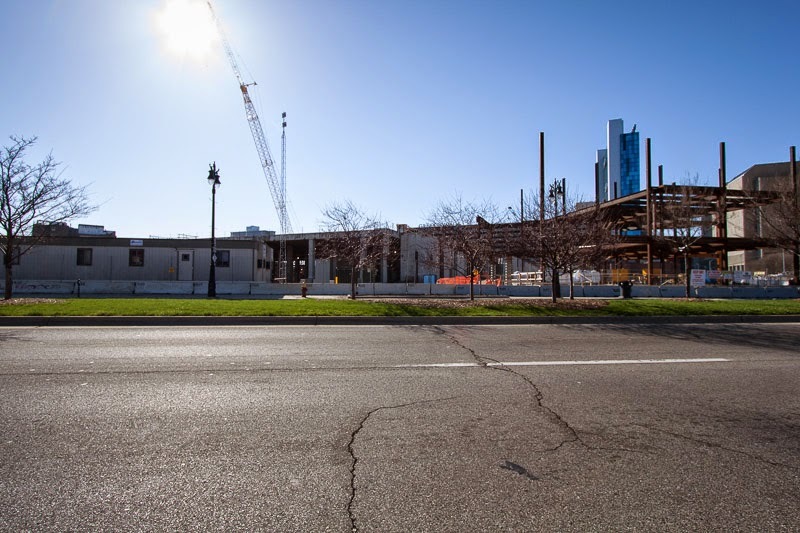 The transformation of Dalgleish Cadillac into Wayne State's $93 million Multidisciplinary Biomedical Research Building is now in full swing. 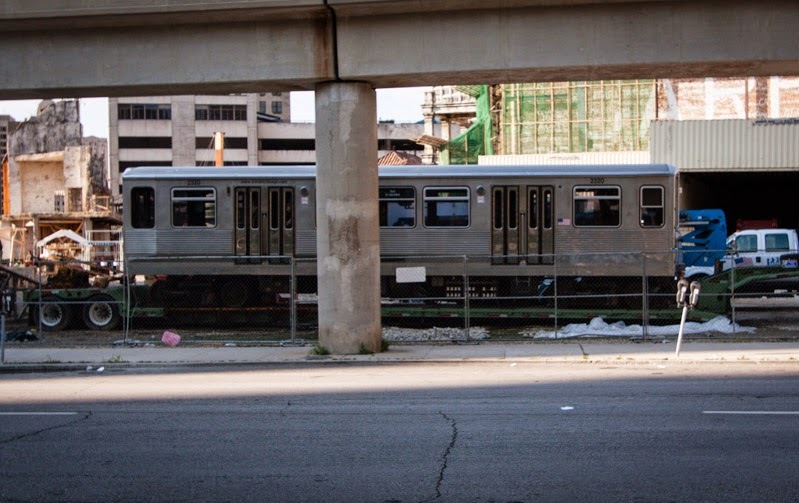 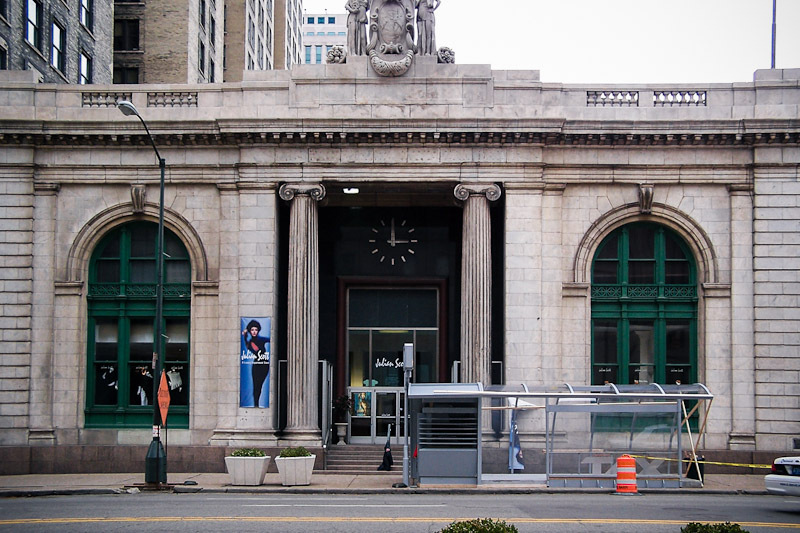 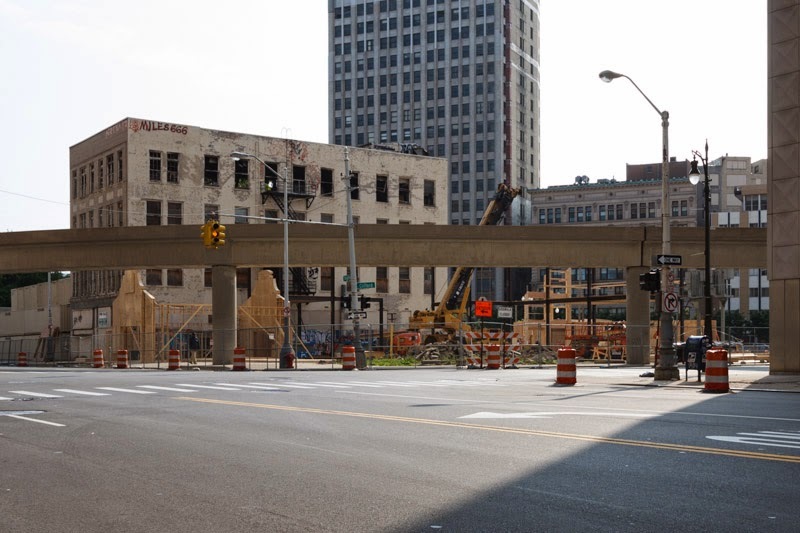 Detroit's latest tube is fully functional. 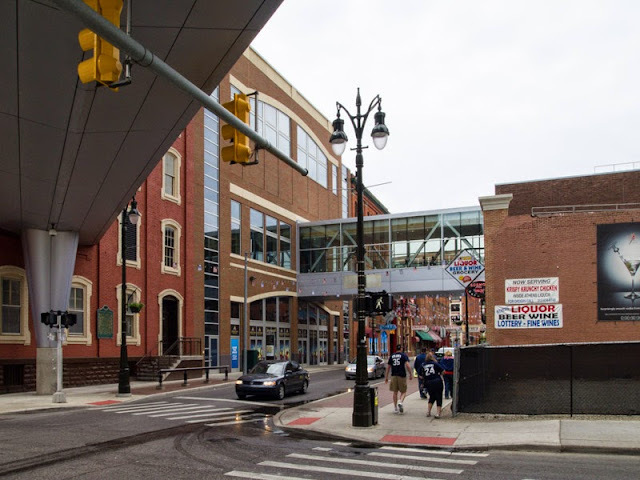 A second Greektown funnel now bridges Monroe street connecting Greektown Casino to its new valet garage. 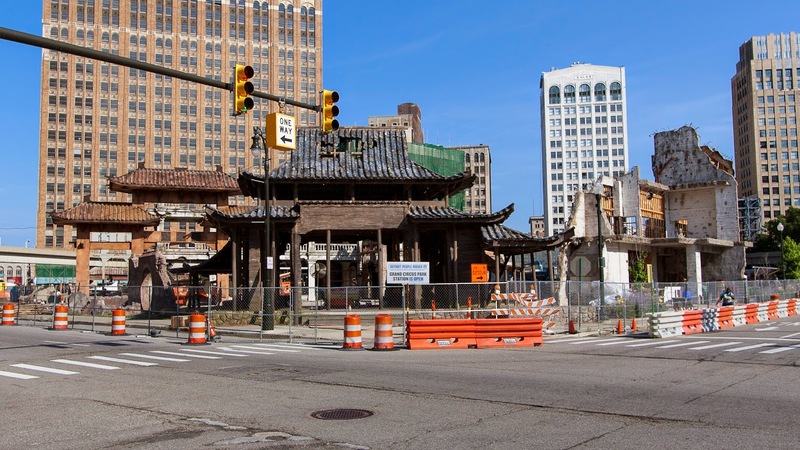 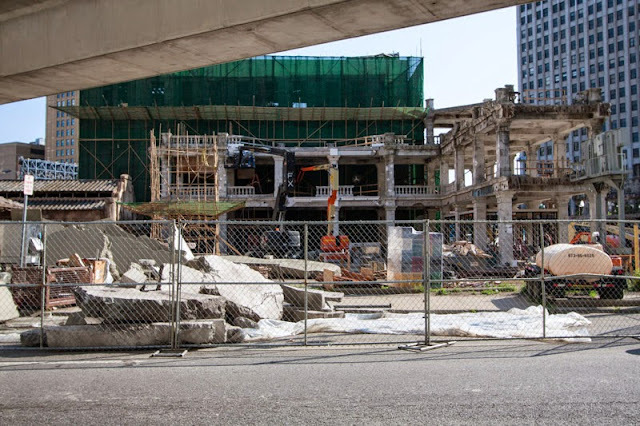 Crews are working at the Statler site to transform the area near Grand Circus Park into a Hong Kong street set for the filming of Transformers 4. 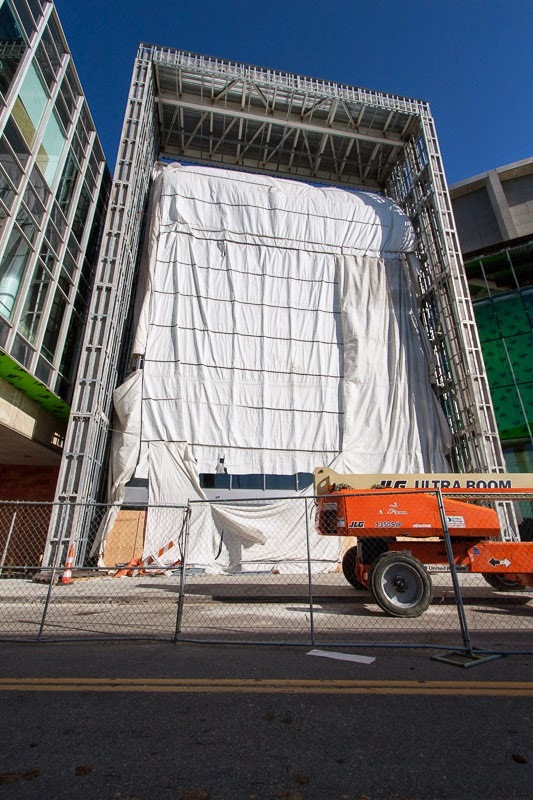 Cameras are scheduled to roll on June 19. 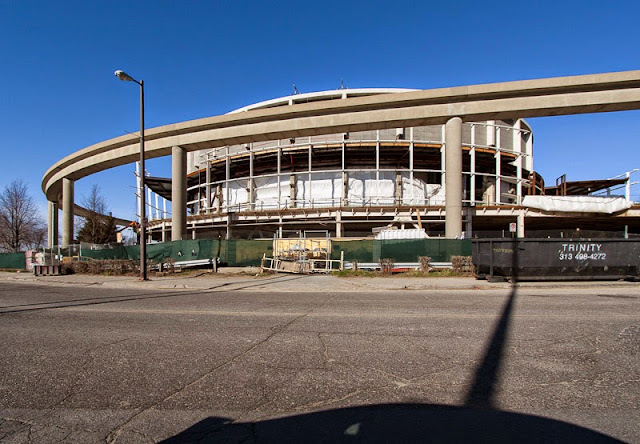 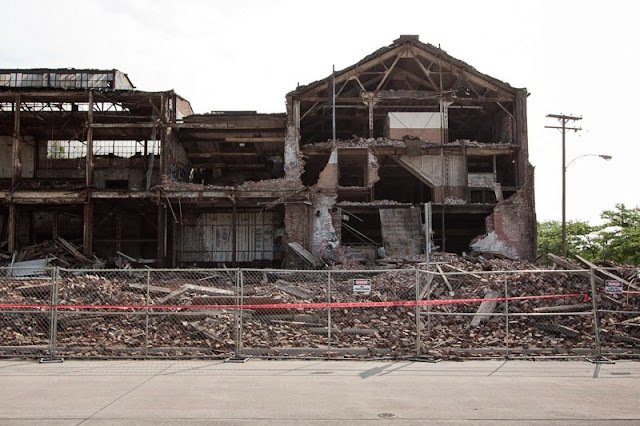 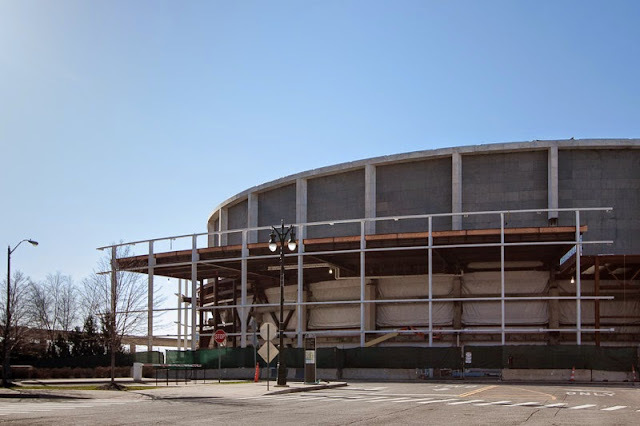 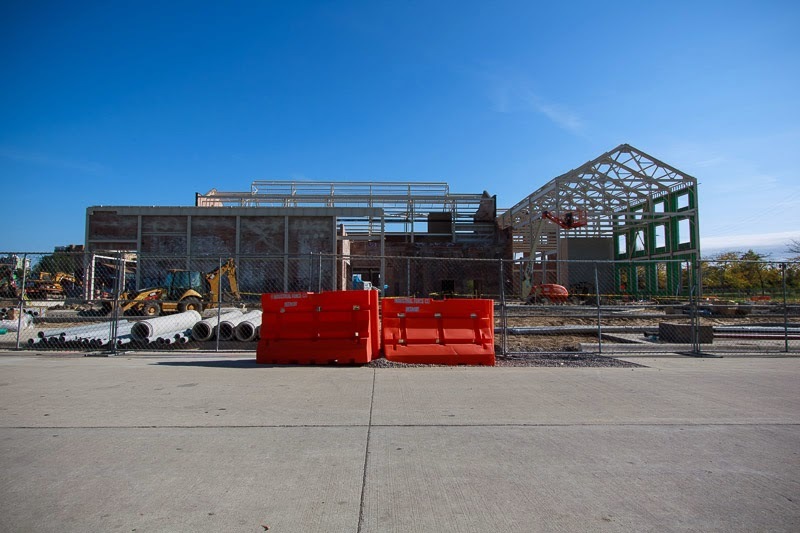 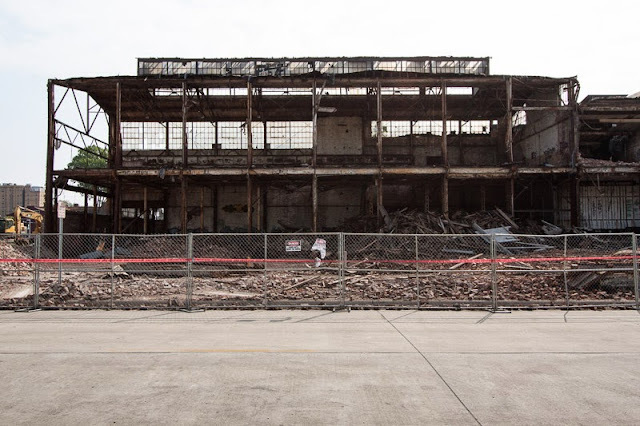 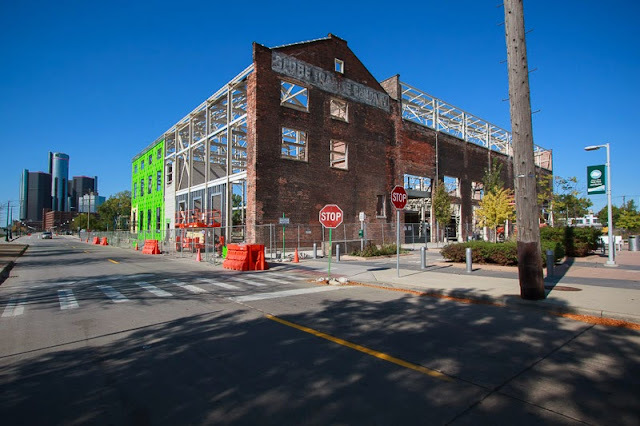 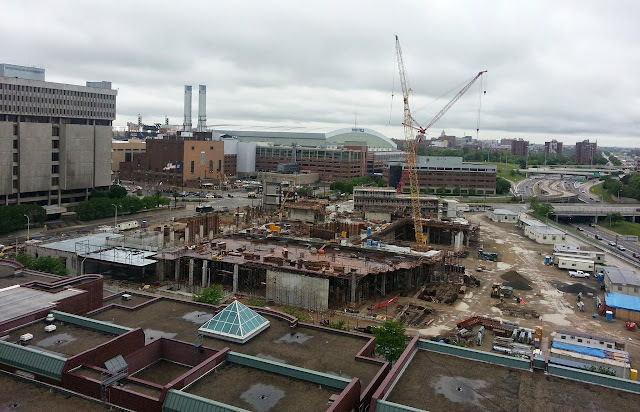 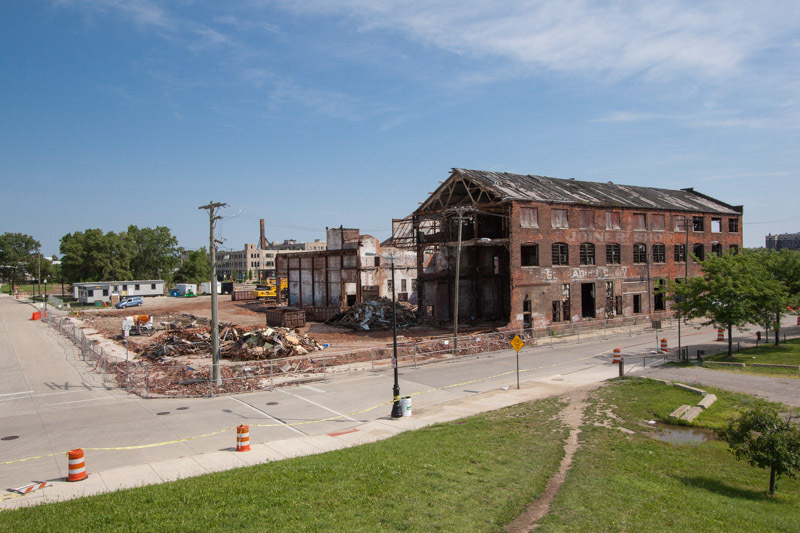 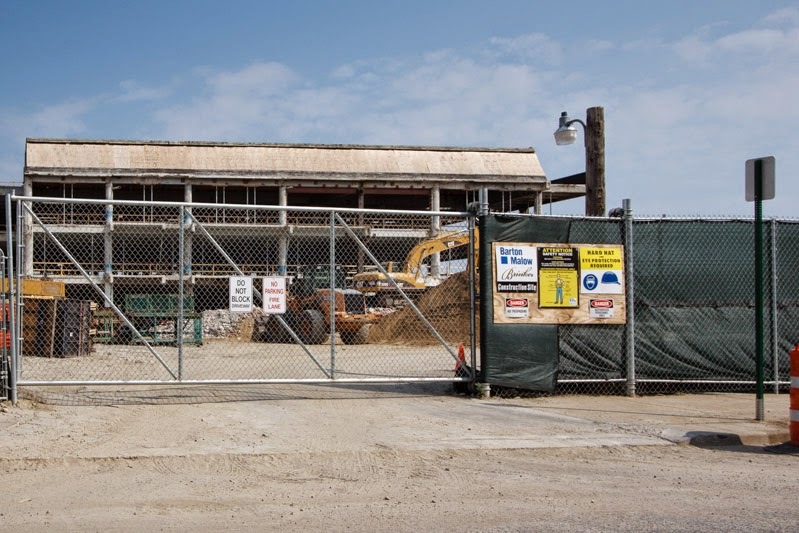 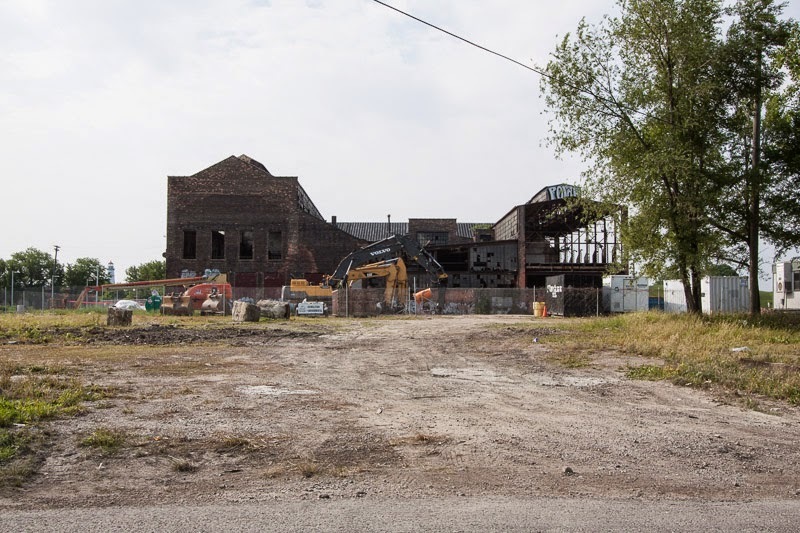 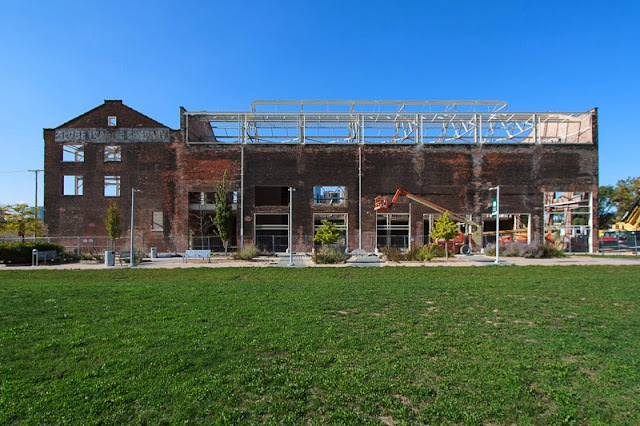 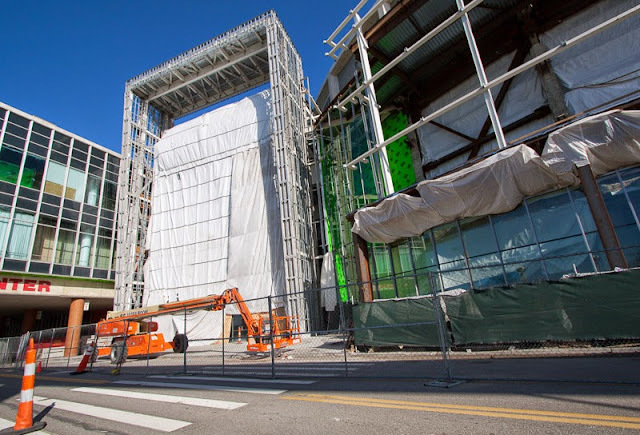 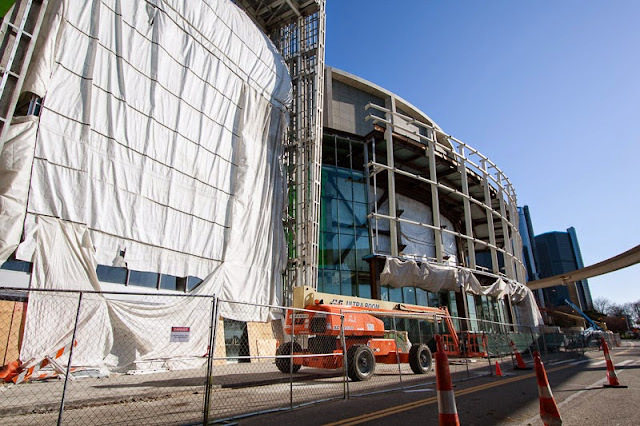 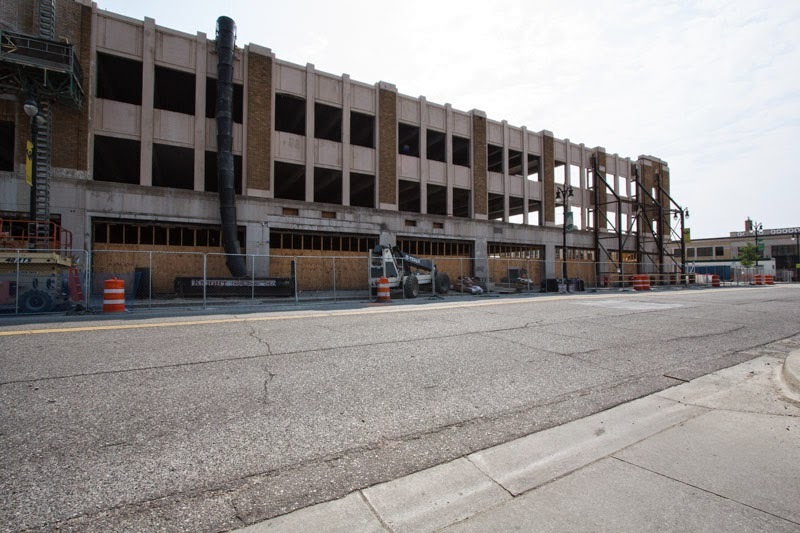 Demoliton work has begun on the largest section of the Globe Trading Company building as it begins its transformation into Michigan's Outdoor Adventure and Discovery Center. The center will be the latest addition to the William Milliken State Park and Harbor when it is completed some time in 2014. 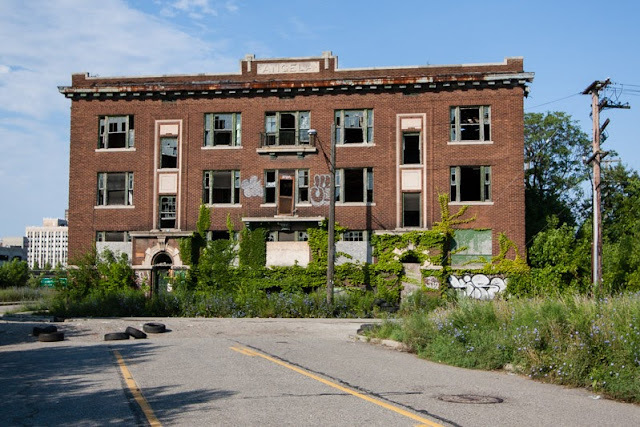 The complex was constructed in phases between 1892 and 1900. 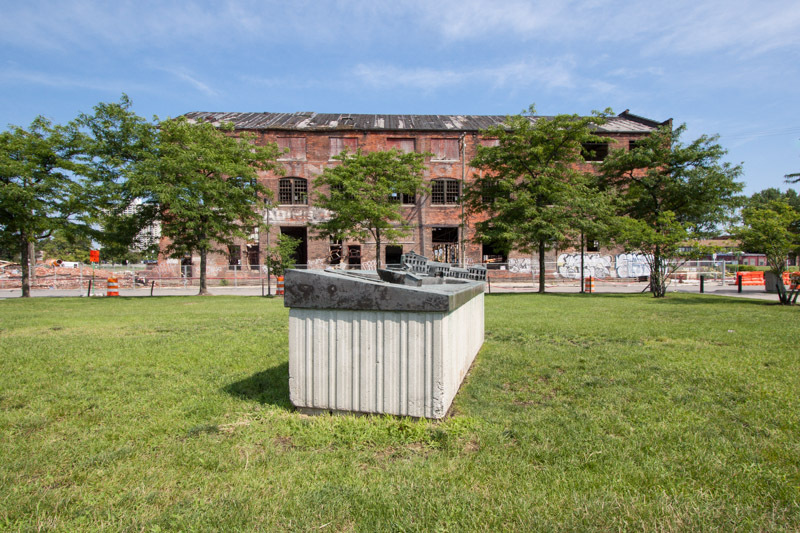 It served as the home of the Detroit Dry Dock Company, Dry Dock Engine Works and the Detroit Shipbuilding Company. 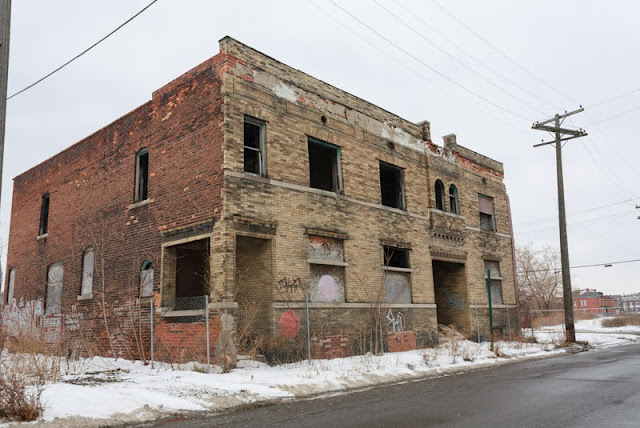 The Boblo Island ferry boats St. Clair and Columbia were both constructed there, and a young Henry Ford worked at the engine works as an apprentice machinist. 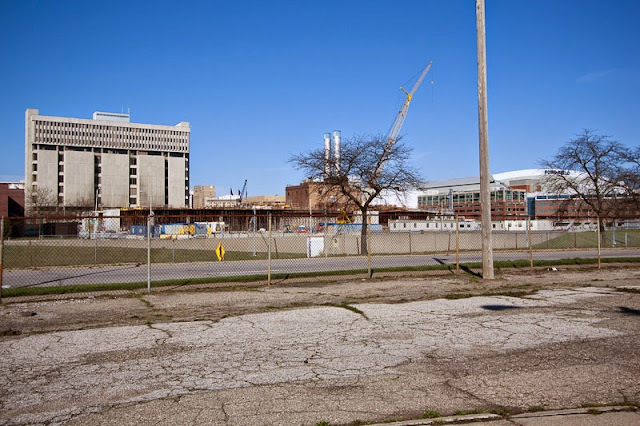 Word came out today that the Wayne County has initiated discussions with Dan Gilbert's Rock Ventures, exploring the possibility of the company purchasing the new Wayne County Jail construction site from the county. 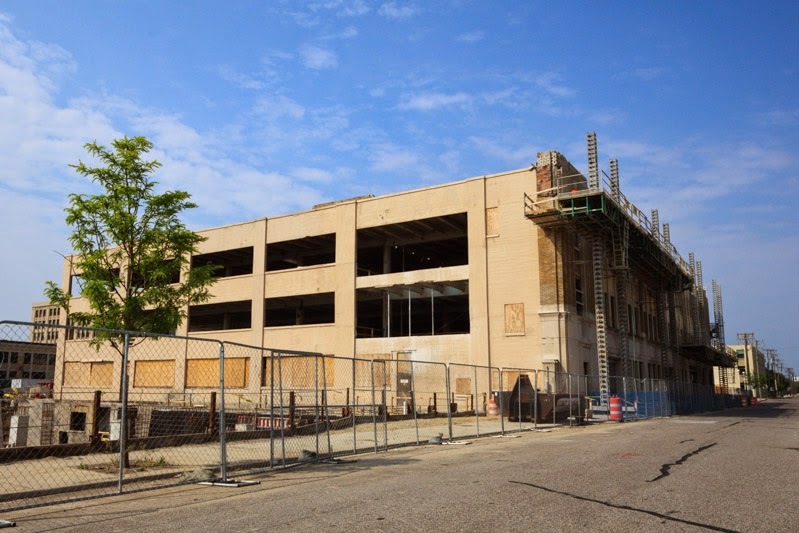 This comes after the county has already spent over $100 million on the partially built jail.